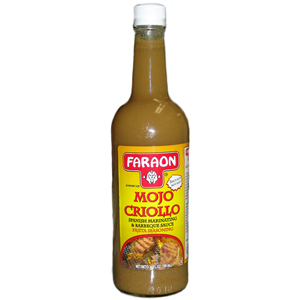 "Spicy but Not Hot" are the first words that you see in the label of Faraon Mojo Criollo. This is an outstanding Spanish Marinating and Barbeque sauce that is ready to go into your favorite chicken, fish, pork or beef cut. Just pour some of this mojo before cooking or preferably let soak in the meat 1 hour before cooking and you will be assured a very tasty result.